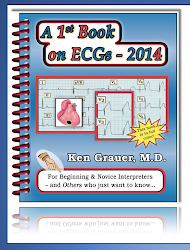 The ECG shown in Figure-1 was obtained from a 40-year old man. Without the benefit of any history — How would you interpret this tracing? 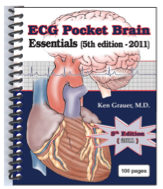 Is there evidence of an acute coronary syndrome? Is there a common diagnosis that potentially explains all of the findings? Figure-1: ECG obtained from a 40-year old man. How would you interpret this tracing? (See text). NOTE — Enlarge by clicking on the Figure. 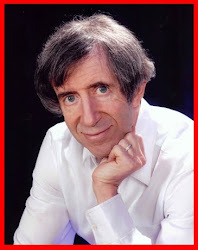 Rhythm & Rhythm — The rhythm is sinus at a rate just under 100/minute. Intervals — The PR, QRS and QT intervals are all normal (ie, the PR interval is not more than 1 large box — QRS duration is not more than half a large box — and despite the fairly rapid rate, the QT interval is not more than half the R-R interval). 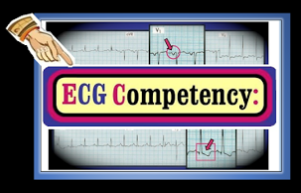 NOTE: We review our rapid assessment approach for intervals in ECG Blog #89. Axis — There is marked RAD (Right Axis Deviation) — as determined by predominant negativity in lead I, that occurs in association with a predominantly positive QRS complex in lead aVF. NOTE: Although the finding of a predominantly negative QRS complex in lead I (especially in association with a completely negative QRS in lead aVL) should prompt consideration of lead misplacement — this is not the explanation here. Instead, the fact that the P wave and T wave in lead I are both positive, in conjunction with the expected negative P wave in lead aVR — tells us there is no lead misplacement. Instead, there is simply marked RAD. 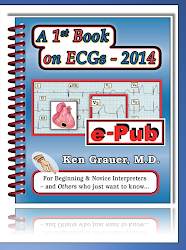 We review assessment for atrial abnormality in ECG Blog #75. Definite criteria for RAA (Right Atrial Abnormality) are met in Figure-1 — in that the P wave is very tall and peaked in each of the 3 inferior leads (the P wave is at least 3mm tall in lead II). In addition, P waves are even taller, as well as peaked and pointed in 5 out of the 6 chest leads (ie, leads V2-thru-V6). 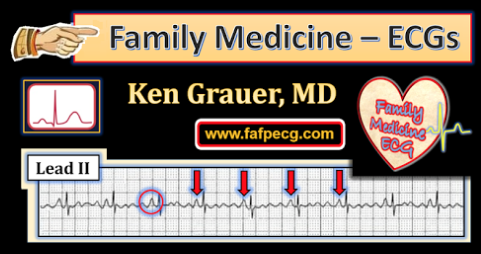 We emphasize that in the vast majority of cases, ECG diagnosis of RAA is made from assessment of the limb leads. The ECG in Figure-1 provides one of those rare instances in which P wave appearance in the chest leads assists to confirm our impression of RAA. PEARL: The presence of a very pointed P wave in either lead V1 and/or V2 is an insensitive, but highly specific ECG finding in favor of RAA that most often indicates marked RA enlargement and/or significant pulmonary hypertension. This is especially true when P wave amplitude of these pointed chest lead P waves is excessive, as it is here (It is rare indeed to see 5mm P waves in any ECG lead!). Although one might think that the deep negative component to the P wave in lead V1 indicates LAA (Left Atrial Abnormality) — we suspect instead, that this is simply further evidence in support of marked RAA. That’s because on occasion, the RA (right atrium) may enlarge so extensively, that it “flops over” and is viewed by right-sided lead V1 as producing a wave of depolarization moving away from V1. The fact that the negative component to the P wave in lead V1 is so narrow (nearly the mirror-image of the upright pointed and very skinny P wave in lead V2) — makes us suspect that this is what is happening here. 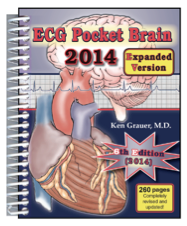 We review assessment for RVH (Right Ventricular Hypertrophy) in ECG Blog #77. 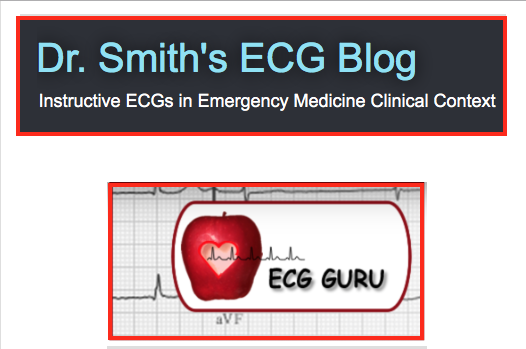 As emphasized in Blog #77 — we view the ECG diagnosis of RVH as a “Detective” Diagnosis — since rarely will any one single finding clinch the diagnosis. 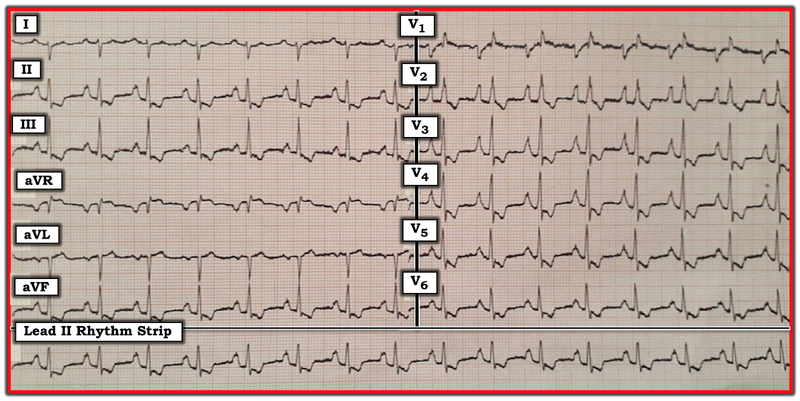 Instead — determination of RVH is usually made by deduction from identifying a combination of suggestive ECG findings. Among the findings we note in Figure-1 that suggest RVH include: i) Marked RAD; ii) Marked RAA (since it is rare for RVH not to be present when there is right atrial enlargement); iii) Predominant R wave in lead V1 (Normally the QRS should be predominantly negative in lead V1); iv) Persistenceof S waves through to lead V6 (Normally the QRS complex is all positive by the time one reaches lead V6); and, v) Diffuse T wave inversion suggestive of RV “Strain” (See below!). PEARL: There is actually a small q wave in lead V1, prior to the predominant R wave in this lead. In patients with RVH — this initial small q wave in lead V1 is often associated with pulmonary hypertension. Q-R-S-T Changes — The last part of our systematic interpretation entails assessment of Q-R-S-T wave changes. 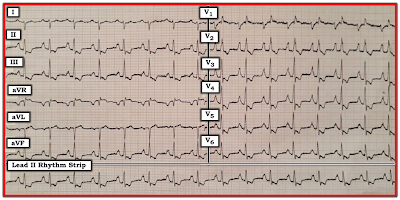 Q Waves — We have already noted the QS complex in lead aVL, and the small q (qR complex) in lead V1. There is also a Q wave in lead aVR which is common, and not indicative of anything special. R Wave Progression — We have also already noted predominant positivity of the QRS complex in lead V1. This leaves us with assessment of ST-T Wave Changes — which show ST-T wave depression in multiple leads! PEARL: There are 2 lead areas that typically manifest asymmetric ST-T wave depression with RV “Strain”. These are the inferior leads (ie, II,III,aVF) — and the anterior leads (usually V1,V2,V3). RV “strain” may be seen in one or both of these areas. Sometimes when there is marked RV “strain” — ST-T wave depression may extend further across precordial leads. This appears to be the situation in Figure-1. CLINICAL IMPRESSION — While one might be tempted to ascribe the diffuse ST-T wave depression in Figure-1 to ischemia — it is far more likely to reflect marked RVH with Pulmonary Hypertension. That’s because this unifying diagnosis potentially explains all of the important ECG findings we have noted above = marked RAD — RAA — the qR pattern and predominant R wave in lead V1 — persistence of S waves through to lead V6 — and diffuse ST-T wave depression consistent with RV “strain”. Clinical Correlation — This 40-year old man has uncorrected Tetralogy of Fallot. 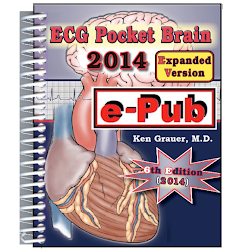 This explains the findings of right atrial and right ventricular enlargement, with pulmonary shunting and pulmonary hypertension. For brief review of the principal clinical findings associated with Tetralogy of Fallot — CLICK HERE. Acknowledgment: My thanks to Haval Issa from Duhok, Iraq for his permission allowing me to use this tracing and clinical case.